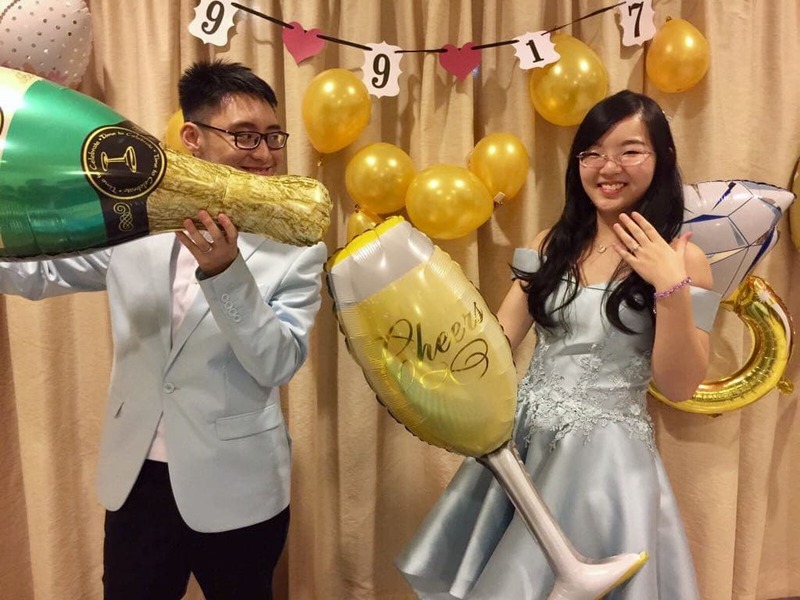 On the evening of Valentine’s Day, I met Calvin Yeo ’20 and his fiancée Fan Yi, who is in her final year at Management Development Institute of Singapore (MDIS) studying Business and Finance. The Chinese New Year celebrations in the Saga Dining Hall had just ended, and the Saga Common Lounge was nicely quiet and private. The mere presence of this homely, almost-married couple seemed to permeate the space; I felt as if I was sitting in this couple’s future home. Behind them was a bouquet of flowers they had bought, which almost seemed to be part of the ‘house’ decorations. This bouquet of flowers is apparently emblematic of their no-frills, practical relationship and their style of direct communication. Instead of buying ‘overpriced bouquets’ for Valentine’s Day, they went to Far East Flora to buy a bouquet of cheap, wholesale, freshly cut flowers which Fan Yi had chosen herself. While they may not express their affection for each other in an elaborate love language or other stereotypically conventional ways, their quiet love for each other shines through how much effort they put in to make their relationship work. CY: She’s very thoughtful. She puts in a lot of effort into what she does so that whoever she is doing it for is happy. FY: He’s a very down to earth person, and he doesn’t do things for me in a very frilly ‘oh so sweet let me do this for you’ way. What goes into his mind just comes out. If he really hates something he’ll say it. This way, I feel that I can be myself and I don’t have to hide or pretend to be someone else. How did this relationship happen? How did you’ll decide to get engaged? CY: We have been together for five years, since Junior College in 2013. I was in Year 2 and she was in Year 1. We first got to know each other because we were co-emcees at the College Awards Day ceremony. After it was over, I told her she was the most decent girl out of everyone. From then on, we just continued to talk. FY: There was actually supposed to be six of us, but both our partners were absent so we had to fill in for them when they ran through the script. There was a lot of free time as we stood at the podium waiting for everyone to get into position. So that was how we started talking. After the whole event, we stayed in contact. CY: Hm… There was not really any start date to the relationship. It just grew. In 2015, we met each other’s parents. I guess you can say that that was when the relationship became kind of official. We also created an “unofficial” piggy bank that we would put money into and spend on special occasions. FY: The unofficial piggy bank eventually grew into a joint bank account. We thought that we might as well create a joint account so that we can start saving, so we don’t have to borrow when the time comes. At that point, we were already set on having a future together. CY: Our engagement was also not very conventional. We went to The Clementi Mall and as we browsed around, she pointed one out and said it was nice. So we bought it. The next day we went back to the same shop, again looking at rings. She found another one she liked, so she bought it for me. I really like that I don’t have to think too hard about what she wants. What challenges did you face in the relationship? FY: Him going to college was a huge jump in our relationship. Suddenly, he was going to live somewhere else and I was going to be alone all the time, especially because I had not started school yet. Before that, when he was in National Service (NS), we were able to spend a lot of time with each other everyday. And then there were all the rumours about everyone living together, in co-ed dorms. College students are all so hormonally-charged. Everyone is mature but not yet an adult; they are all at this certain carefree stage. That year, there was also the news of the lewd orientation games at the National University of Singapore (NUS), which also didn’t help. CY: On top of the college transition, there were also the differences in the kind of attention we were used to receiving because she’s an only child and I grew up with a family of three brothers. When I was single, I was very used to doing my own stuff. Now when I’m with her, I have to purposely allocate time during the day where I must interact with her. I can’t go into my own world and game for 16 hours without talking to her. FY: Now, especially with the sense of confirmation and certainty that comes with the engagement, I’ve grown to be more open and mature. CY: I think that eventually we both grew into a middle ground that we both share now. You know the saying, “Happy wife, happy life”. How do you spend time together and how has it changed over the course of the relationship? FY: We’re both very private people. We actually just go to each other’s houses to chill and watch a movie or eat. We like private confined spaces. CY: If we’re not eating, then we’re gaming. Earlier on in the relationship, we had a ‘Gamer’s Night’ where we’d stay overnight and game together. It’s rare to find someone who likes to game with you. Sometimes we’ll be playing Counter Strike at 2 am and get scolded by her parents. FY: Our love language is time. It doesn’t matter what we’re doing together as long as we have time near each other. We don’t always have to be talking, we just have to be sharing the same space in the same room. We just feel the comfort of having the other person nearby. Fan Yi and Calvin chatting during the interview. How do you think being engaged has changed your college life? FY: In college, there’s the pressure of balancing your social life, school work, and your love life. Out of the three things, being engaged means that there is one less thing to worry about. Everything is nicely settled so you can focus on what’s important. There’s no need to look for a partner or go on dates, which makes for a more focused student. CY: When professors know that I am engaged, they treat me more like an adult. Sometimes during consultation, we’ll end up talking about how I got engaged. FY: One practical thing that we did when he started college was that we set up some rules for each other. For example, he doesn’t text or reply other females past a certain time if it’s not urgent. He will wait until the next morning to reply. We also don’t eat with the opposite gender one-on-one or drink alcohol without the other person present. Another thing that we do is that we don’t go to sleep angry at each other. We will resolve it no matter how long it takes, to avoid the conflict spilling over to the next morning. If you go to sleep angry, you will wake up angry the next morning. CY: Additionally, some people get into relationships in the heat of the moment. Committing to a relationship should not be taken lightly. Relationships have the potential to destroy a lot of lives. This happens especially when you break up, don’t resolve your differences, and carry that baggage into another relationship. I think communication is very important, especially in terms of expectations and plans. At the low points of the relationship, it is very important to think of why you love the person in the first place, because romantic feelings are not constant. This will help to tide you through your problems.